May 4, 1992 – University of Chicago trustees announce that the school has selected a site east of Michigan Avenue and north of the river, as home for its downtown Graduate School of Business. 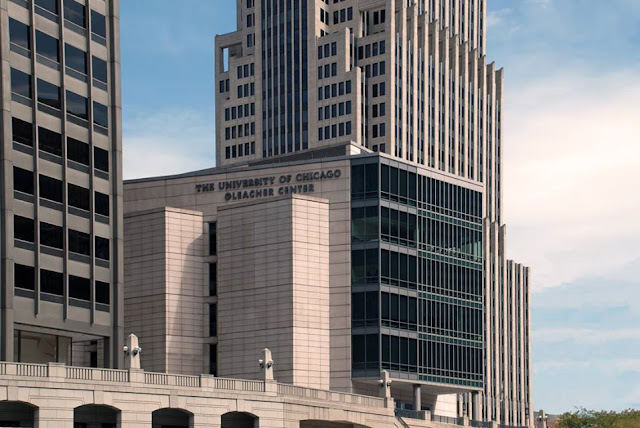 “This project reflects the university’s commitment to maintaining a substantial presence downtown, while also providing a state-of-the-art facility in which to train tomorrow’s business leaders,” says Hanna H. Gray, the U. of C. president. [Chicago Tribune, May 5, 1992] Lohan Associates, a Chicago architectural firm, will design the center, and McHugh Construction Company will be the general contractor. If you are on the river sometime, notice what an understated example the Gleacher Center is of contextual design. The tier of windows on the western third of the building’s south face relate beautifully to the Mid-Century Modern style of the 1965 structure at 401 North Michigan, Gleacher’s next door neighbor to the west. The tier of windows on the eastern two-thirds of the building relate equally well to the SOM’s 1989 Post-Modernist Art-Deco throwback NBC tower just to the east. Anyone not looking for it might well miss it, but this is contextual design that shines.